Glen Jankowski, Sarah Gillborn and Rowan Sandle write. Black History Month is apt to bring our collective attention to overlooked work by BME psychologists. Take for example Mamie and Kenneth Clark’s (1939) study in which they imaginatively asked 258 black children aged 3–7 which black or white doll was ‘a nice doll’, ‘a nice colour’ and ‘like you’. The researchers found that the children routinely preferred the white dolls and, most poignantly, became visibly upset when they answered the last question; forced to confront the fact that they were different to their preferred doll. These findings were more prominent in those children who attended segregated nurseries. It is hard to think of a psychology study that has made a bigger impact than this. In 1954 Dr Kenneth Clark presented the research to the US Supreme Court in the case of Brown vs. Board of Education. He used his and Mamie’s findings to show that segregation had profound effects on black children’s wellbeing, helping to end formal educational segregation. Both Kenneth and Mamie dedicated their subsequent professional and personal lives to providing accessible therapy, employment advice and housing assistance to the Harlem community. Their important work has provided a backdrop for many BME psychologists who, like Kenneth and Mamie, are driven by a strong commitment to undoing injustices and an even stronger aversion to the ivory tower of academia. For example, Claude Steele’s (1995) stereotype threat work shows how racism concretely impairs exam performance using experimental methods. More recent work in this vein includes that by Guilaine Kinouani (https://racereflections.co.uk), a clinical psychology doctoral student, equality consultant, therapist and founder of the Minorities in Clinical Psychology Training Group (@minoritiesgroup) and that by Professor Ama De-Graf Aikins, whose work focuses on experiences of chronic illnesses, Africa’s non-communicable disease (NCD) burden and the social psychology of knowledge in African settings. Attending to this work is important given our discipline’s historical racism. For example, in May 1990 this magazine published Phillipe Rushton’s research purporting to show black people were less intelligent and less law abiding, and had greater STIs compared to other races. But it is also important because our discipline’s racism arguably continues today. Most of our journal articles are edited by Westerners (99%) written by Westerners (99%) and use only Westerners as participants (93%: Arnett, 2008; Heinrich et al., 2010). Even our teaching is overwhelmingly white and Western. Recently I and colleagues at Leeds Beckett University coded the ethnicity, nationality and gender of every author of every reading we set from the module handbooks of our BSc Psychology Hons course in 2015/16. Of the 215 readings we set, written by 380 authors, 96 per cent were white, 99 per cent were Western and 64 per cent were male. Soberingly, the module that I (Glen) set reading for was no better than any other. I should note that our course team works hard for our students. We teach innovative and critical psychology. We have a strong feminist foundation (which the above content analysis highlighted the importance of, 64 per cent of authors were male) and staff that generally strive to be sensitive to structural oppression regardless of what they teach. So to be clear then, this is by no means a problem specific to our institution. Indeed, there is a whole movement, Why Is My Curriculum White?, dedicated to highlighting and decolonising whiteness in higher education globally. The problems with such a curriculum should be obvious. 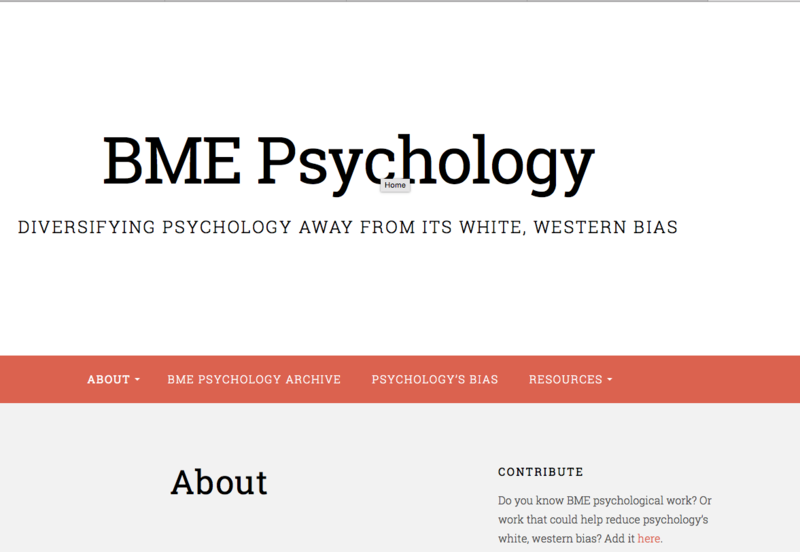 We’re overlooking BME psychologists’ work, we’re teaching content that is less likely to show how racism relates to health, development or our social world (or any of the stuff psychology professes to explain), and more simply we are not teaching the psychology of people but the psychology of white, Western (and often male) people. With Leeds Beckett colleagues we have therefore set up a website signposting to such BME psychological and anti-racist work. But we need help. If you know any of the many BME psychologists we have no doubt missed, please add them to our archive. If you are willing to share anti-racist teaching materials or would like to use them, then please do.